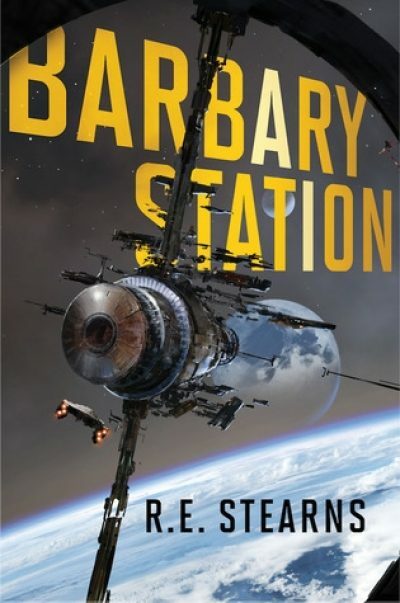 2017’s Barbary Station is the first book in R. E. Stearns’ Shieldrunner Pirates series. Faced with crushing debt and poor employment prospects, two women in love plan to hijack a large, expensive space ship and use it to buy their way into the pirate gang currently in possession of the so-called Barbary Station. Thelma and Louise, in SPAAACE. Adda and Iridian’s scheme is such a simple, straight forward plan it’s hard to see how it could possibly go wrong. Indeed, it works almost perfectly until the pair and their hapless, expendable ally arrive at the station, whereupon their helper is shot dead and the two women learn they have made a slight miscalculation. Everyone believes the pirates are in control of Barbary Station. In fact the pirates are merely inhabiting it, as are a gaggle of refugees from a recent war. The entity who effectively controls the station is the station’s security AI. The AI’s instructions do not include tolerating trespassers, including Adda and Iridian. As far as the AI is concerned, the current collection of humans are unwanted vermin, to be expunged as circumstances permit. The logical thing for the pirates to do would be to evacuate the station. They dare not. Once they are outside, the AI can turn its guns upon them. Inside the station, they are not safe, but at least safer. The AI cannot take any actions that would threaten the habitat. Given the choice between swift, inevitable death in the vacuum of space or a slow, gradual extermination within the station, the pirates have chosen option two. It’s not at all the glamorous life of adventure Adda and Iridian had expected. In fact, it may be a very short and unpleasant life, unless the ladies can find some way to convince the AI to spare the surviving humans. And even if they can manage that, the pirates may well turn upon them. I seem to be in a judgemental, grumpy mood as the seeping buboe that was 2017 draws to a close. Bear that in mind…. I really like interplanetary adventure so I was hoping to like this. For that matter, I like thrilling caper stories, so a novel about heisting an entire spacecraft should have appealed. But the grand plan involves tricking a lot of people who purchased tickets in good faith into abandoning ship in deep space. The main crime those people have committed is to be better off than the couple and to be spear-carriers in Adda and Iridian’s story. It may be that there’s just no way to tell a story about actual pirates that doesn’t involve them taking other people’s property. What this novel reminded me of is any number of Traveller adventurers. It has all the classic elements: the promise of wealth given only will, cunning, and an abundant supply of firearms; the reality that get-rich-schemes are never as easy to carry off as they might seem. It’s like finding a hundred dollar bill on the street. If the bill were real, someone would have already picked up. It’s probably fake, bait for a pit trap, or is coated with a potent neurotoxin. The same goes for fictional capers; unless the story is about the consequences of success, the wheels will start to fall off the plan as soon as the characters are too committed to give up. Barbary Station is available here (Amazon) and here (Chapters-Indigo). I'm clueless, here, James: OK, context is for the weak, yes, -- but is "Sherbrooke" for the weak also? Huh. Well, those two methods of posting links in comments don't seem to work. Stan Rogers wrote a song about someone who became a privateer for the easy wealth, only to discover sometimes the victims shoot back.